Vikram's role in his upcoming Tamil film Thaandavam is based on a real life character and he has dedicated it to his source of inspiration. 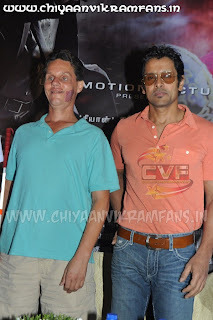 Vikram plays a RAW agent who turns blind in the film and it is inspired from visually challenged Daniel Kish, an echolocation expert and is also the president of World Access for the Blind. Speaking at an event here, the actor said: "I dedicate my role to Daniel. Had it not been for him, we couldn't have done this film." The actor underwent training sessions in echolocation, the ability of humans to detect objects by sensing echoes, with Daniel, who also plays a small part in the film. Daniel, who was flown down for the event, said, "Working with Vikram was a delightful experience. I felt like I was training one of my own students." Thaandavam also stars Amy Jackson, Anushka Shetty, Jagapati Babu and Lakshmi Rai. G.V. Prakash has composed the music for the film, which will have a worldwide release Sep 28.